SAROLANGUN - After the construction of a Micro Hydro Power Plant (PLTMH) in Lubuk Bangkar Village, Batang Asai District, Sarolangun Regency, Jambi Province marks the success of a new innovation financing model for the development of new renewable energy (EBT). The development of the Lubuk Bangkar MHPP is the result of cooperation between the United Nations Development Program and the ESDM Ministry's Directorate General of Energy and Mineral Resources with the support of the National Zakat Agency (BAZNAS) through zakat funds and Bank Jambi with CSR funds for Fulfilling Electricity Access and Poverty Alleviation in Jambi Province. Through the financing model innovation, UNDP together with the Directorate General of EBTKE supported zakat funds from BAZNAS amounting to 350,000 US Dollars (around Rp. 4.8 billion) and CSR funds from Bank Jambi amounting to 281,357 US Dollars (around Rp. 3,76 billion). 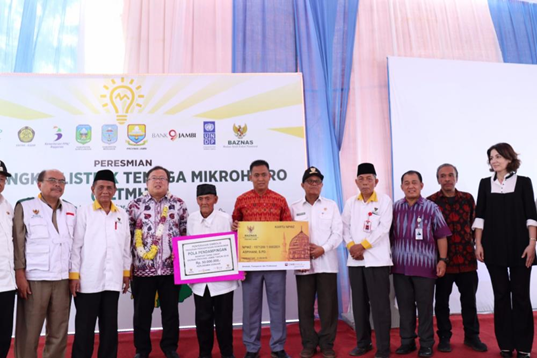 This fund is used to build a PLTMH unit and revitalize three units of PLTMH which provide electricity access to four villages in Jambi Province. This is the first support by BAZNAS in the use of zakat funds for sustainable development purposes (SDGs) in Indonesia and maybe even in the world. One new PLTMH unit that has been built in Lubuk Bangkar Village has a capacity of 60 kW and has been operating on Independence Day August 17 2018. Meanwhile, 3 revitalized MHP units are located in Ngaol Village, Air Liki Village and Air Liki Baru Village, Tabir Barat District , Merangin Regency has a capacity of 40 KW each and operates well at the end of August 2018. This program provides electricity access to 4,448 people from 803 households. To maintain the sustainability of the PLTMH, operators in each village will be trained to manage the power plant. "This development is a joint initiative from the community that is implemented through funding cooperation from several parties. New development and revitalization of PLTMH Jambi has become one of the efforts to realize equitable energy for the people of Indonesia. We really appreciate and support this program," said Director of Planning and Development EBTKE Infrastructure, Noor Arifin Muhammad while attending the Inauguration of Lubuk Bangkar PLTMH on Wednesday (5/9). In addition, the PLTMH Jambi initiative is one of the tangible application forms of the SDGs, especially in increasing access to clean and affordable energy to support poverty eradication and increase the prosperity of the community. Not only provide electricity access to the community, but also provide long-term influence on regional development to reduce the national development gap. Lubuk Bangkar Village is one of the poorest villages in the district. Batang Asai. Access to this location is taken for 8-9 hours by road from Jambi City, with the terrain of the dirt road and up and down the hill. 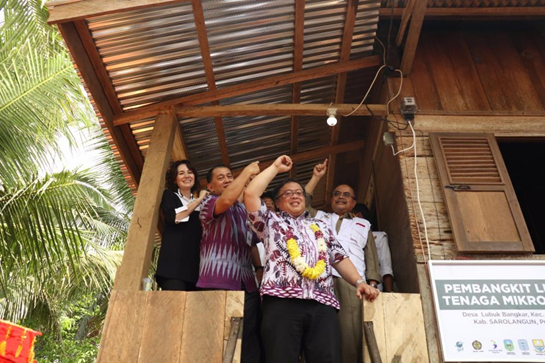 The availability of electricity access is followed by the Baznas and UNDP programs for community economic development. The use of electricity is used for the process of grinding and packing of coffee beans, production of banana chips, increasing handicrafts of pandanus mats and processing of animal feed. The villages of Ngaol, Air Liki and Air Liki Baru are the most remote villages of Tabir Barat sub-district, which is directly adjacent to Kerinci Seblat National Park. It is a 10-hour land route from Jambi city, plus a 2-hour river route by boat and a 30-minute motorbike with steep up and down terrain. "The construction of this PLTMH is very important because the electricity that enters the village for the first time will give hope and opportunity for residents. Previously, the birth process was forced to be done in complete darkness, the children learned and worshiped with light and electricity without electricity, the opportunity for entrepreneurship was very small. This is the first example of how an inclusive partnership between UNDP, EBTKE-ESDM, religious organizations (BAZNAS), and the private sector (Jambi Bank) can empower local communities and contribute to the achievement of SDGs, "said Cristophe Bahuet, UNDP Indonesia Country Director on the same occasion .